A Welsh-born sheepdog who now works in Japan has flown 6,000 miles back to Denbighshire to compete in a trial. 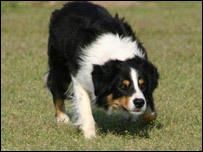 Ben, a three-year-old black and white border collie, was bred by world champion handler Aled Owen from Corwen. He was bought by business partners Noriko Mizutani and Daisuke Takanami and flown to their home city Osaka, where trials are increasingly popular. Ben arrived in Corwen on Wednesday ahead of taking part in a sheepdog competition on Thursday. 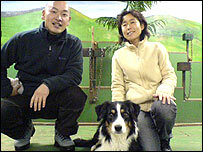 Mrs Mizutani and Mr Takanami travelled to Wales in 2003 after hearing Welsh-bred border collies were amongst the best in the world. The pair are dog teachers in Japan, where competitive shepherding is a fast-growing sport. They bought the dog from world champion handler Aled Owen, who runs the Ewe-phoria sheepdog visitor centre at Llangwm, near Corwen. On Thursday, Ben will complete at the centre in a special "nursery challenge" for young dogs at the end of the season. And his owners will be fulfilling an ambition to visit Wales and compete in an authentic Welsh trial. Mr Takanami said: "I had started a sheepdog training centre in Japan and felt that without the ability to have an excellent working dog available, the centre would not succeed. "We had heard of Aled Owen's reputation through his dogs and one was offered for sale through his website." Mr Takanami said interest in sheepdog trials was increasing in Japan, but was still in its early stages. Mr Takanami added: "I would like to become the best sheepdog handler in Japan if possible. "I have gained invaluable advice from Aled Owen, which I know will help me achieve this goal." Asked whether Ben could win the trials, Mrs Mizutani said: "That would be wonderful, but it's more important to us to have a wonderful time and enjoy the experience." Ben's breeder, Aled Owen, added: "We're very excited about the trial - we're just hoping for some good weather. "I have seen Ben over the last few days, and he looks like a really nice dog." "Daisuke Takanami isn't your typical shepherd"